Player superstitions and rituals are legendary: Michael Jordan allegedly laced up a new pair of shoes before each game, and many current NBA players have established rituals involving peanut butter sandwiches. Similarly, the fans of those sports have their own rituals and superstitions that they believe affect the outcome of that game. In a new marketing campaign, Ticketmaster likens the fan experience to that of the player. 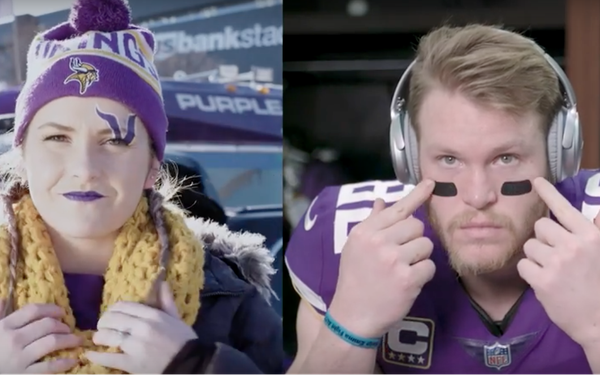 A new ad running on social outlets features Minnesota Vikings tight end Kyle Rudolph and his team’s fans getting ready in a split-screen format. As Rudolph puts on his dress clothes to head to the stadium, the “professional” sports fans put on their jerseys and get ready to tailgate. At the stadium, Rudolph puts his game face on with music and eye black, while the fans paint their faces. The spot ends with Rudolph heading to the field, just as the fans enter the stadium. The insights for the campaign were gleaned from a survey Ticketmaster conducted with 1,000 NFL fans in November 2017. The results revealed 90% of NFL fans believe the crowd in the stadium can influence the outcome of the game, and 30% of them believe game-day superstitions and rituals can have an impact. The partnership with Rudolph presents a potential noteworthy opportunity. Should the Vikings triumph against the Philadelphia Eagles on Sunday, it would be the first team to ever play a Super Bowl in their its stadium. Should that occur, Economou expects high demand for tickets from local fans. The approach is meant to position Ticketmaster as the fan’s ally, understanding what fans want out of the game experience and ensuring they get what they pay for, Economou says.